Christie Brinkley is the spokesperson for Ultherapy for good reason – it is a natural non-surgical facelift treatment that works! Ultherapy, a fantastic alternative to plastic surgery, uses ultrasound to trigger new and natural collagen production three layers deep within the skin. The result? Skin that is lifted and an appearance that is rejuvenated naturally and without surgery! Ultherapy - Is it worth it? 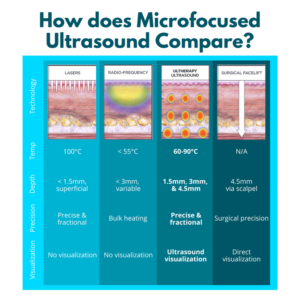 Ultherapy uses two kinds of ultrasound waves – standard and micro-focused. The standard ultrasound waves provide visual imagery to ensure the therapy is delivered exactly where it is intended. The micro-focused ultrasound waves approach each other from the left and right, meet in the middle and form an X. Where this X is formed, a point of friction is created and generates a precise temperature. This exact temperature triggers the body to create new collagen. This process is repeated by laying down hundreds of micro injuries into and under the three layers of skin. The third and deepest layer of micro injuries occurs directly into the connective tissue located on top of the muscle and under the subcutaneous fat. This is the same layer addressed in a facelift during plastic surgery. Producing collagen in this deep layer of collagen-rich connective tissue is where most lift in the skin happens! The precise temperature created at exact locations within the tissue with micro-focused ultrasound waves is what makes this therapy both unique and effective. The precise temperature is imperative because if the heat is not warm enough, it will not cause neocollagenesis, the creation of new collagen. While plastic surgery requires weeks if not months of downtime (assuming there are no additional complications), there is no downtime with Ultherapy. After your treatment, the skin might feel sore or tender. This is more likely to occur when using the 1.5mm transducer during The Glow Treatment as it impacts the area immediately below the skin. Additionally, you might think your skins looks/feels tighter or there might be very little, hard to notice, bumps on the treated area that can last 48 hours. Ladies of DLS are ready to help! This treatment uses our advanced 1.5mm transducer to work immediately below the skin. It helps clarify, reduce the size of pours and give your skin an overall glow. This is an ideal treatment for clients in their 30’s that don’t need a full lift but are looking for support with lines, wrinkles and early skin laxity. Using our 1.5mm transducer in conjunction with the more penetrating 3.0mm and 4.5mm transducers is what allows our Denver clients to get full non-surgical facelift benefits. These two deeper layers are what do the bulk of the lifting, with the third layer doing the most. This Full Lift Ultherapy treatment is perfect for people with medium to moderate skin laxity. Purchase three treatments in the same area for maximum lift & results, and receive a 10% discount! Combine 3 Ultherapy treatments with 3 treatments of MicroNeedling to reduction to lines and wrinkles. Purchase of 6 treatments = 20% discount!